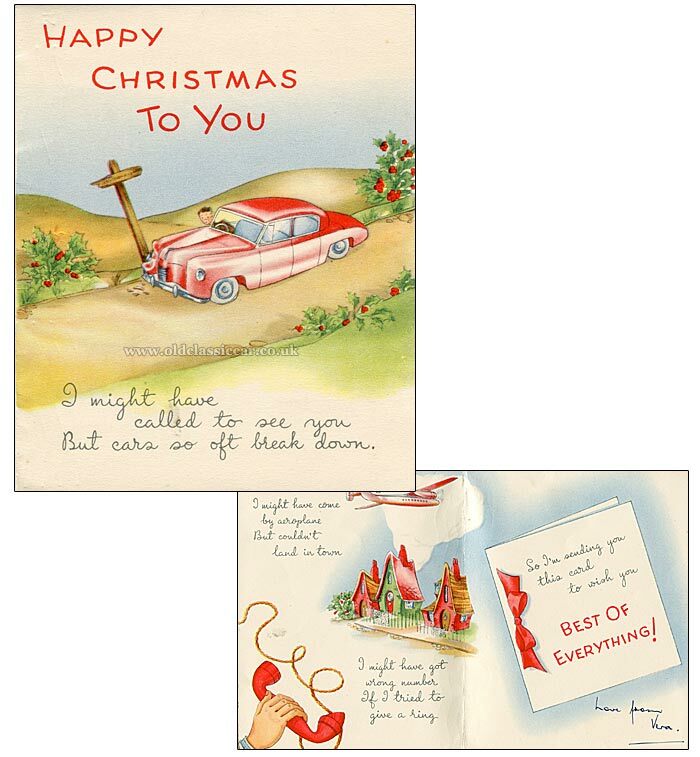 1920s & 1950s car-related Christmas and New Year's cards & poem. Homepage. 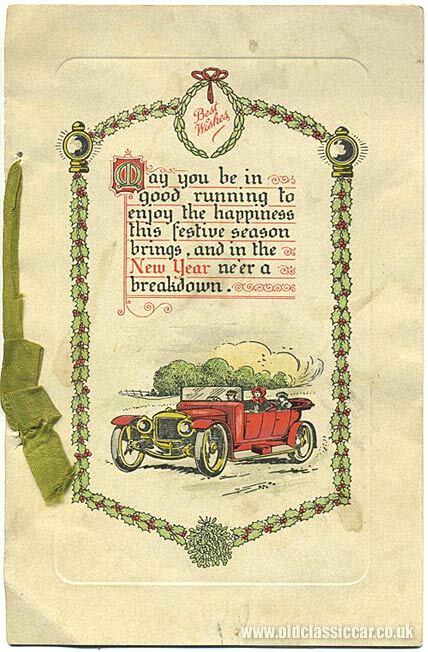 This page: Early 20th century Christmas & New Year greetings cards, designed for motoring enthusiasts. Christmas and New Year best wishes cards. "May you be in good running to enjoy the happiness this festive season brings, and in the New Year ne'er a breakdown." The vintage-era greetings card, produced by W. McKenzie & Co. of London, isn't dated, but the style of car suggests early 1920s. The lucky motorists, or aspiring motorists, to receive this card were Mr and Mrs Ernest Hawkins, sent by Mrs Alfred Roberts - perhaps a fellow motor-car owner and driver. The inside of the card includes a small painting of a snowy village scene, and a verse wishing health, happiness and prosperity to its recepient. It's interesting to note that motoring breakdowns tended to feature in Christmas greeting cards for many years, as this page demonstrates. Motoring-related Christmas cards from the 1950s. The following two Christmas cards were produced by A.M. Davis & Co., Quality Cards of London. The first presents an unfortunate chap, who has managed to park his car (which looks rather like a Singer SM1500) into a wooden signpost, with predictable results. Only the inclusion of holly in the illustration gives a hint of the festive season, although the writing makes up for the less-than-seasonal scene. "I might have called to see you, But cars so oft break down. I might have come by aeroplane, But couldn't land in town. I might have got wrong number, If I tried to give a ring. So I'm sending you this card, to wish you BEST OF EVERYTHING!" 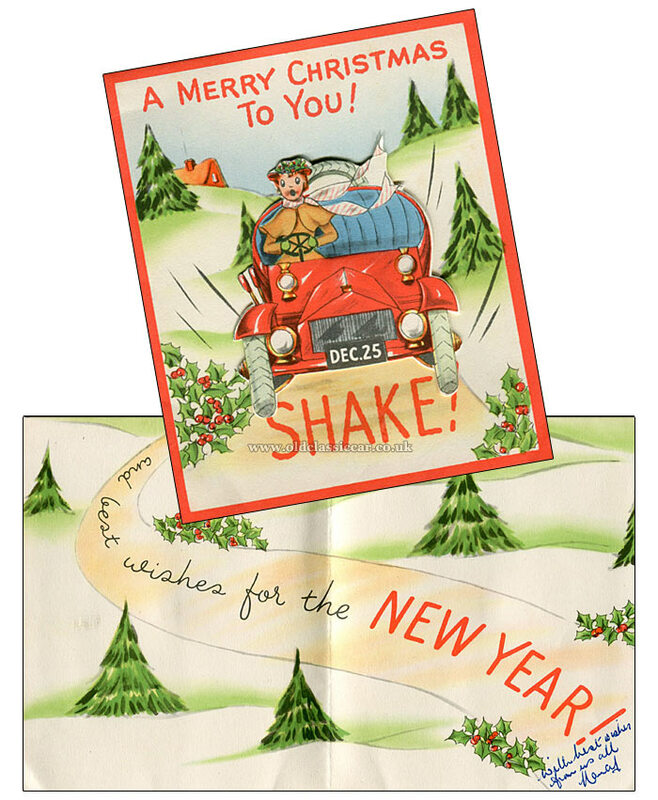 The second of these two cards is also from the 1950s, although features a veteran car on its cover. The female driver hangs on for dear life, as her horse-less carriage streaks along the road. The car itself is printed on a separate piece of paper which is attached to the cover of the card, enabling it to shake if the card is waved about vigorously. The verse is altogether simpler in this example, but at least references to motoring breakdowns are absent here. all that was needed was one tiny part. but now that same box was completely empty. despite endless searching the score was still two. with parts from old motors, dishwashers and clocks. nothing was found to replace the part lost. a whole year of waiting, now total despair. and out went a call describing the plight. all of them members of Old Classic Car. there was even a member from distant Orkney. with twenty more helpers and all of their gear. then up went a shout "hey, look what I've found"
when it comes to mechanics, these guys are no fools. gaps got adjusted until they were right. now was the time to go for ignition. these guys were all experts and none were concerned. it paused for a second and then it was off. everything polished until it all gleamed. each looked at the other, but nothing was said. when they did what was needed, they did, what was right.